Weinberg freshmen Yi Yao Fu and Tony Chen talk to a representative of Evanston Neighborhood Properties at the ASG Housing Fair. 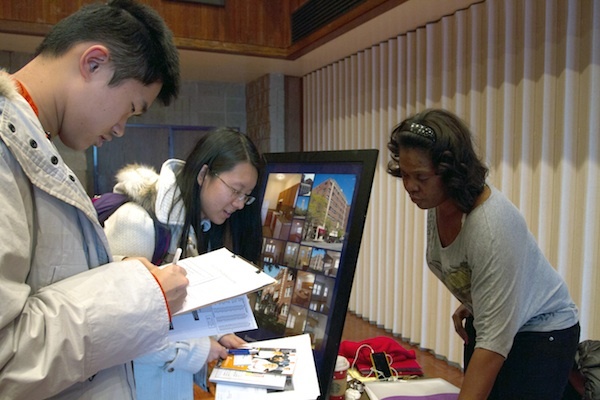 Associated Student Government held its housing fair Wednesday to provide information about living off-campus housing to Northwestern students. This is the second year ASG has hosted the fair. The event, held in the Louis Room in Norris University Center, featured representatives from several property management companies in Evanston. About 150 students stopped by between 3 and 6 p.m., according to ASG representatives. Steven Monacelli, ASG Community Relations vice president, said the fair aims to connect students with resources and get them started on the search for housing if they plan to live off campus. The attendance at this year’s fair was less than half of the one held last Winter Quarter, which attracted 400 students. Monacelli said the low attendance rate is mainly due to the time change of event and decreased landlord presence. Six landlords attended the fair, a showing of three fewer than last year. Representatives from North Shore Apartments & Condos, BJB Evanston, Evanston Place Apartments, Open Communities, Apartment People and Evanston Neighborhood Properties talked to students about housing options. Handouts, landlord contact information, budget spreadsheets and other general tips were available at the fair. “Few students have experience of renting apartments by themselves, so it’s important to have this kind of event that we can help them walk through the selection process,” said Polly Shaykin, a representative from North Shore Apartments. Shaykin said location is the number one factor for most undergraduate students, as they want to live as close as possible to the campus. Graduate students are more flexible about where they live, she said. Weinberg freshman Siyu Chen said he hoped attending the fair would make his search for housing easier. Monacelli said ASG created the fair in response to a survey conducted in Spring Quarter 2011 that asked students about their need for off-campus housing resources. He added that ASG is trying to work with the Undergraduate Budget Priorities Committee to create another survey to get student feedback on the effectiveness of the housing fairs. In addition to landlords, officials from University Housing and Residential Life were present. Representatives from WildcatPad, a free online platform launched last January to facilitate the exchange of housing information among NU students, local landlords and real estate agents, also attended the event. No Evanston officials were invited to the fair because they do not have a direct hand in providing housing to students, Monacelli said.